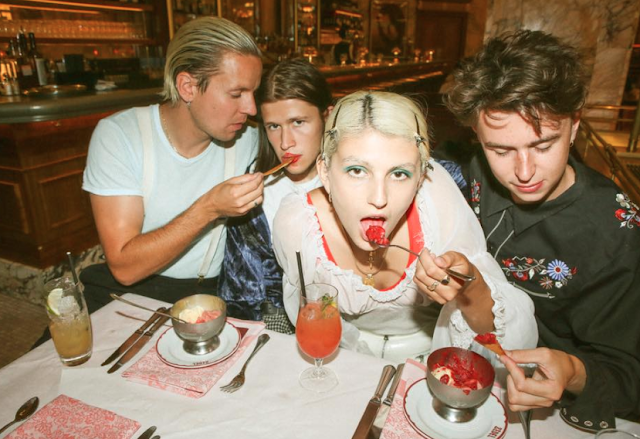 With their debut album, it seems as if the powerful foursome of Confidence Man (Reggie Goodchild, Clarence McGuffie, Janet Planet and Sugar Bones), may have created a new genre of music perfect for strutting down the street. Confident Music for Confident People provides lively, strikingly daring music produced through the eyes of the self-assured individual. The album boasts eleven bold tracks, including four of Confidence Man’s earlier singles, 'Boyfriend (Repeat)', 'Bubblegum', 'Better Sit Down Boy' and 'Don’t You Know I’m In A Band'; which is the newest to the collection and an instant classic banger. The album manages to capture the inner-monologue of any young adult who has been caught thinking in the centre of a dance-pit. The opening track 'Try Your Luck' has a fun pop feel and the lyrics are as confident an introduction to an album as one could wish for, with lyrics essentially telling people how good they are while proudly strutting their sound. 'Try Your Luck' provides a strong start to the album and a kick off before the fun begins. The second track, 'Don’t You Know I’m in a Band', (which is Confidence Man’s most recent single) is a standout on the album. With low, yearning vocals by Sugar Bones and lyrics that describe the life of a young band member, the song is sharp and it's driven by a house bass kick and popping synth swells. 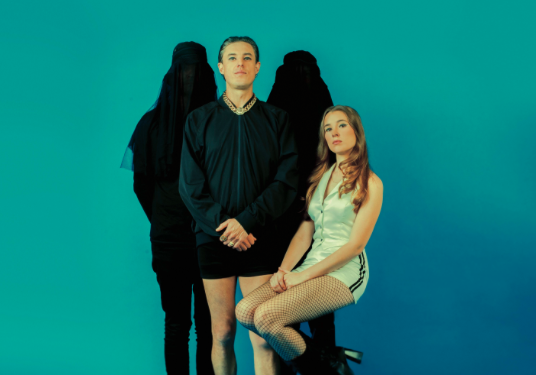 Not only can Confidence Man mix multiple genres into their sound (highlighting funk, dance and pop), the lead vocal duo of Sugar Bones and Clarence McGuffie, often switch vocal positions, and often involve spoken lyrics. The fourth track of the album 'C.O.O.L Party' takes the essence of this idea and skillfully expands on it. 'C.O.O.L Party' has Clarence McGuffie explaining how COOL the party of the year is. The track has a focus on spoken lyrics, with interjections from Sugar Bones voicing the word “cool”. The lyrics are the real focus of the recording but don’t detract from the boundless, dynamic dance soundscape occurring under them. The album bounces through multiple contemporary dance genres with some songs having a particular throwback quality, with beat patterns reminiscent of early 2000s dance tracks. This includes 'Out The Window' and the centrepiece of the album, 'Let Me Catch My Breath'. 'Out The Window' focusses on the heavy bobbing bass. The high jubilant vocals are also wishing for “a good time”. The light keyboard chords help move it away from a sole dance track; especially in the back-end of the mix. On the other hand, 'Let Me Catch My Breath' feels like an early 2000s dance mix, with repetitive hooks and a solid rhythmic beat pattern working throughout the track. It’s the kind of track you could expect to hear at any house party playlist — it quickly lifts the mood wherever it’s played to new heights. The track also works in some grooving key lines and soaring synths to further build the track from a dance track to a fusion of electro-indie production. 'All The Way' brings the funk through Confidence Man’s strong use of bass guitar and driving Latin-inspired percussion section. It moves away from being solely a dance track, but still having sections that explode with energy — especially through the chorus’ group vocals and incumbent bridge, which swells with vitality. The album closes on 'Fascination' — this track brings the album to a classically cool end. 'Fascination' showcases what has made all of their other tracks pop so well with their, bouncing funk bass lines. Percussive elements, such as the use of the tambourine, bongos, and the group vocals have a soul-like vibe. All of this works together perfectly in 'Fascination', with no sound overpowering the other, and ultimately helps the recording stand-out amongst the plethora of memorable tracks on the album. Most of all, Confident Music For Confident People lets everyone have fun. The album should even have the most reserved individual getting up and having a dance. When the tracks come on, it’s almost hard not to move; whether you’re at home, in the car or just walking out in public. The album stands apart from a lot of other tracks in the electro-indie genre, as Confidence Man is able to fuse so much more into their sound. The focus generally sits on the dance beats and accompanying sounds to build the energy; but the vocals, occasional percussion and piercing relatable lyrics really help put Confidence Man’s album in a league of its own.